Home » Gold Peak coming? Gold is rallying very hard here off the late 2015 lows along with the gold miners. Is this the start of a new gold bull and a persistent rise as we saw from the 2000/2001 lows? Good question. While I had anticipated a rally to start soon in precious metals, I am surprised at its nature. I have been expecting a long term bull market for gold and silver to potentially start in this time frame (2016 and beyond). The worry I have is that we could be seeing a very strong rally into a 4 year cycle peak. Gold is best analysed on a peak to peak basis. The gold miners on the other hand probably work with both trough and peak analysis. We’ll stick with gold here today. The peak gold cycles are very consistent when looking at 4 and 8 year cycles. The odd thing that occurred into the 2011 high was that we had a short 4 year cycle at 42 months. Prior cycles had been 48, 50, and 47 months for the 4 year cycle. So nominally gold should have peaked at year end 2011 or at the start of 2012. Because this 2011 top was likely a secular high, we may have seen a failed cycle peak (ie. late 2011) at that point in time. 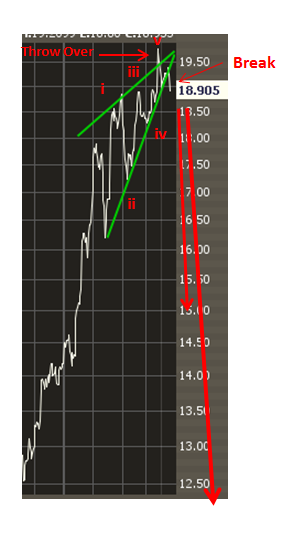 This idea of a failed cycle peak could be much like what is discussed in Elliott Wave theory when a final expected wave, in this case up, does not come to pass. This has important implications for gold and that it may not have finished its bear market. So what is my concern with this current rally? The rise is so sharp that there is risk gold is making a 4 year cycle peak some time soon. If we take 48 months forward from the end of 2011, we arrive to this time frame. This rally could persist to late March and possibly reach as high as $1350 – 1400. If this scenario is plausible, and once this rally concludes, gold is probably best sold until things become clearer. To be honest, this was not what I was expecting this year. I am long gold but looking for exits on this trade. No need to panic Your first thoughts were probably right. This might be a gold bull…. timing is a little off but within the range. Is there a chance we see a trough instead of a peak within that timeframe (late March – early April)? There are too many possibilities now to be sure what we will see in the coming weeks. I do know this. This rally in gold is a pure fear trade and when it concludes, look for equities to form an important bottom. Technically the high could be in for the 4 year peak. There is just no way to know until after the fact. I would be very careful with trading gold (ie. new positions) here on a short term basis. If gold can hold a 50% retracement of its recent move and rally once again, there are higher targets. I would have expected the 4 year FLD to be touched or broken to the upside to signal an end to this rally. That has not occurred yet. So the peak could be in, or it could form next month or in April. But I would expect it to be rather soon. Levels I watch from a volume point of view are GC 1234 and now 1307.80. If gold can retake 1234, and make a new high, that 1300 level would likely be tested next. Tuesday this week will be a very important point to determine direction for gold and equities. PS Rancho, a 4 year cycle high here for gold would be a problem for bulls well into year end. However, there are other possibilities. Gold right has reached the Upper Limit of the Dominancy Envelope 1 Year (256 Trading Days) in brown. This point is concurrently ALSO the fronteer of the Descending VTL of magnitude 3 in red which connects the 2 last Tops noted T3 (because price has successively broken or touched 3 Envelopes. as you can see we are yet under the Displaced Resistance Curve ( in red) calculated by adding one Gann “octave” – here 125 points – to the Resistance Curve (in blue) calculated according to Paul Levine’s MIDAS methodology. – moreover the (1×2) Ascending Angle (1 Unit of Price x 2 Units of Time) buid a Support for the Uptrend, building also an Ascending Contraction Triangle with the (6/8) Support and Resistance Line. sorry I mixed up the graphs ! Have you seen the COT (Commercials Short positions) for Gold and Silver? It has moved parabolic to Gold’s. I guess it’s possible for higher highs of this parabolic move of Gold….but it’s well known that even the tulip parabola as well as all other parabolic moves ended below the origin. For new gold positions, it’s best to first let this parabola fuel burn off and then see. After all, why be in such rush to lose money? When Hurst jives with EW, it’s a very special moment. This ending pattern sends shivers down bull spines! Thank you everyone for all your technical analysis contributions. I am a big fan of complementing Hurst work with other methods, especially Gann and EW. While I think gold/silver and the miners are bottoming in the big picture, I’m not convinced a trending new bull has arrived just yet. One factor is the $USD. It is due for a top in 2017 sometime (simply following a 16 year cycle there), and so one has to expect more tests as a bottom forms in the precious metals space. I have no intention of shorting anything here, but I think it will require patience to see how this plays out this year. Trading the shorter cycles long will probably be worthwhile and I will look to do that this year. PS Nice moniker oh Quiet One. I wish your coverage of Gold/Silver was a future guest speaker presentation for Hurst Webinars that David Hickson holds. I do not understand your excitement….. is there a new EW theory? Please explain how an impulse from the low is the end of a correction, because you are drawing new lows?!?!?! – the bottom for gold is behind us this is wave 1, but the 4 year cycle top is in and we will see something like gold 1999-2001 crawling lower for more than a year, but with higher low. I think this is a good example of why I switched to Hurst cycles about 10 years ago as my primary method. I really can’t say if we’ve seen an impulse here for gold or not. I’ve been fooled many times before. 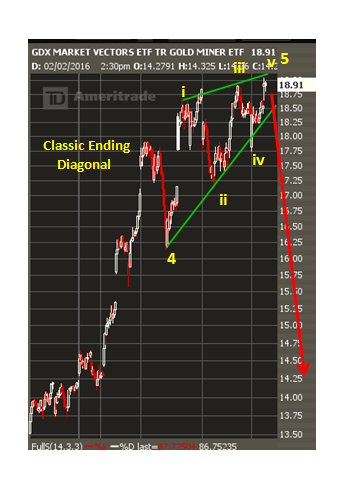 And I am uncertain that we’ve seen an ending diagonal form to end the move for the miners. What I do know is that gold is hovering here about midpoint of a 20 week cycle. Count it peak to peak or trough to trough. If gold manages to rally beyond 12 weeks, that would be something new. My Gold Hurst says it’s finishing E category UP; and F-G-H is next and that the 80 day cycle might not have been reached or is extending. However, it all depends on how one re-pins the troughs or peaks. Based on my EW and Hurst category analysis, they jive. I’m certain others will disagree but besides EW and Hurst, recent gol’s parabolic move, unsustainable COT levels, Stochs on daily/weekly are very overbought and diverging with price very much ahead of its 50 day MA, etc etc all say: If I had no position in GDX, now is NOT the time to be taking new buy actions but new Sell actions. If I have long exposure to GDX, it’s time to take sell actions. If I have short exposure to GDX, it’s time to ADD to these short positions. I call this the Hurstian-Decision Support Engine (DSE has EW, Stochs, and other components). It helps me to be as objective as possible. 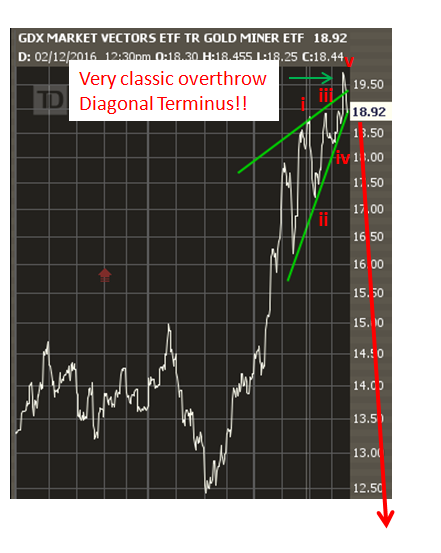 Of course, if H-DSE says it’s time to sell and GDX is only retrace to $15.24; then it’s time to sell. However, the dollar hasn’t yet put in it’s top yet and my target is 122 which translates to gold going for a lower low one more time. Such analysis can give us some good guidelines for a first “Initial Cyclic Model” to clear the path. But concretely we deal with real troughs and real peaks on a graph We deal with “composite cycles” which are the sum of others cycles at work in the data. For me I stick first to the Envelopes system. This system, by the way was the FIRST that Hurst used for trading and determining / hierachizing – troughs, peaks, and cycle duration – even the amplitude of the move also. A few weeks later the market confirmed it’s bullish nature. – EW impulse higher expect more to the upside after a correction. – bullish right translated 20 week cycle something new – this move is not part of the decline from 2011. – market breadth bullish behavior staying overbought for weeks which happens in a bullish move – this move is not part of the decline from 2011. – bearish – gold reversing and making new lows – I will give 0% probability to this scenario. Nothing to support it. – bullish – the move up is wave 1/A correction lower into Mai for 2/B and continuation higher 3/C – it is possible, but taking into account cycles and USD lower probability. – the middle way – correction stretching to September-October with higher low. I expect one more 20 week cycle lower after Mai with possible higher high for gold miners in June-July. This is my preferred scenario here is why. 1. After an impulse the next move is a correction so no new lows, but I expect to correction to stretch for a few months because of the reasons below. when USD makes it’s top/bottom. Look at this chart http://static.safehaven.com/authors/rambus/40720_d_large.png and compare them. Gold bottomed in 1999 but it really took off after the USD made it’s final top. I expect something similar gold bottomed earlier, deep correction for roughly six months and really to take off after the final USD top.